I read it somewhere on a Disney Pinterest board and immediately fell in love with it. I liked it so much that in less than 5 minutes it was there on my work desk too. And then it got me thinking. We humans are not a happy bunch. We have a tendency to compare – compare our lives (and everything that comes with it) to others. Forget others, we also keep comparing ourselves to our older self (when we were high achievers, or before we took a break). And then we complain. We get depressed. This is then followed by lot of health issues, declining performance, stress building. All this together, makes us sadder. Brene Brown rightly said "You either walk inside your story and own it or you stand outside your story and hustle for your worthiness." And so, instead of just complaining, if we took charge and owned it, life would be so much simpler. 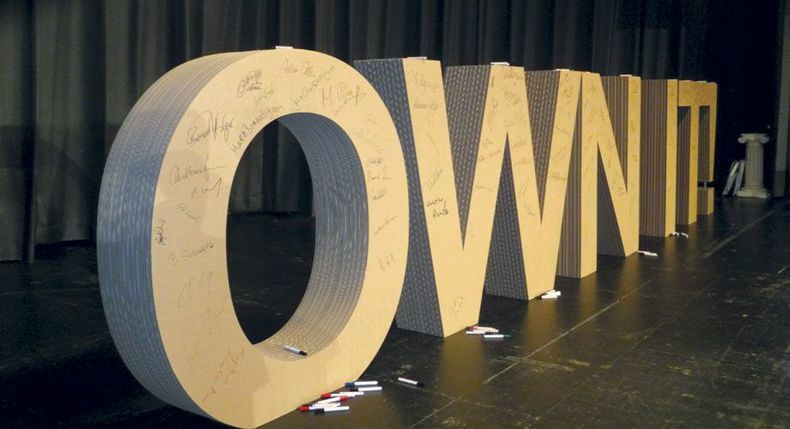 Own the true you! The quirky parts, the things that make you genuine and lovely! It starts with you. You own it, your own voice, your own thoughts. Else you shall end up chasing gimmicks for the rest of your life. Stop. Get on board. With yourself. Rest shall fall in line...like magic.